When I set out to write a piece about the Chaika 3050, the first ever quartz movement produced in the Soviet Union, I did my due diligence by checking past threads on WUS to ensure I wasn't missing any important details. While this isn't a particularly popular model, its importance as the first quartz movement from the USSR does represent an important milestone in Soviet horology, so I wanted to get my facts right. Well, after discovering this thread, I gave up: https://forums.watchuseek.com/f10/cha...ch-848468.html. The author, vpn, covers everything. Read up! I cannot think to add anything more. The reason for the video is to properly illustrate how this movement functions. I was quite surprised upon opening the case as I haven't seen a quartz with moving parts before (maybe this is common -- I don't study quartz movements closely). In addition, you can definitely tell this is an early mechanism. In stark contrast to the crisp, immediate "tick" of modern quartz movements, this is more of a slow "blub" from one second to the next. Interesting to see in action. The paperwork is also curious. I cannot read Cyrillic, but the papers appear to depict a basic rendering of how the quartz mechanism works. I can't imagine any mechanical watches offering a similar explanation on the receipt. This was pretty advanced stuff! Last edited by mroatman; August 1st, 2016 at 07:03. Straight_time, oldfox, REDSWAN13 and 7 others like this. Great watch. I have one (in much less pristine condition than yours). 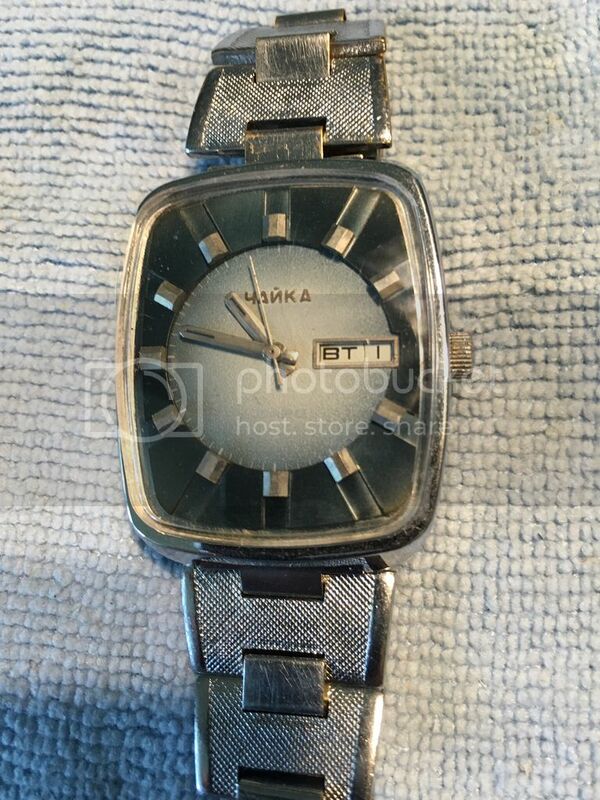 I also have what I think might be the Raketa with the same movement and 'prismatic' glass referred to in vpn's thread (his photo is no longer available). Something interesting I noticed about both of these, when you pull the crown out to hack, the second hand stops, but listen closely and the mechanism is still ticking, so I imagine a gear driving the hand is disengaged while the motor is still running. On other quartz I have when you hack, you hear nothing, so I imagine the motor completely stops. As far as so many moving parts, I think that ask these parts exist in modern quartz, but they have long been miniaturised and encased in plastic units out of sight when you view the mechanism. Last edited by Shai1; August 1st, 2016 at 07:39. Ah yes -- a ticking second hand would necessarily require moving parts. Duh! Yours are really great, especially that Raketa example. I love those unusual crystals, and the condition of yours appears flawless. Yes, the Raketa should also be powered by a caliber 3050, but perhaps there were some minor revisions for Petrodvorets, I don't know. Black dial...interesting! Never seen one like that. Thanks for sharing. Actually its blue like yours. A bit of fading and poor lighting for the pic make it look black. It's actually in better shape than it appears in the pic. Some wear but not abuse. Very interesting mroatman . I almost brought one of these but am determined not to go off course with my collection. At least now I can watch your video. I almost brought one of these but am determined not to go off course with my collection.